In the period from 2017 onwards, the Government of Vietnam has many policies to exploit and develop the natural and cultural resources of the country to attract tourists to Vietnam. 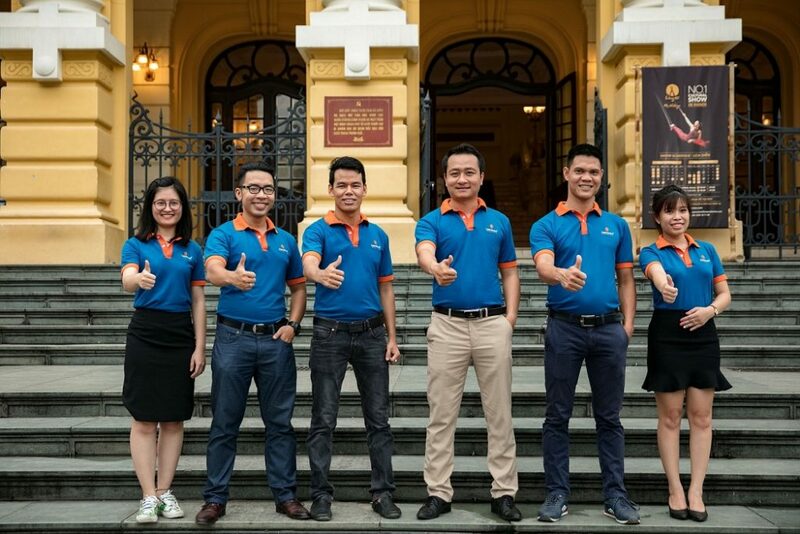 Along with the movement called on youth entrepreneurship opportunities Vietnam precede, a startup project has been launched which is Genesis Cruises Vietnam. Genesis is a start-up project, started in June 2017. After more than a month of official set up and preparation, in 15th July , the first product of the company was introduced to the public in the launching ceremony to new partners present at the conference room of hotel in Hanoi. The first product focused on the tourist who have high-budget but have less time and want to experience the most highlight wonders Halong Bay in just one day tour from Hanoi. After a period of the preparation and marketing, Genesis’s first cruise with 18 visitors departed to explore Halong Luxury Day Tour on August 1st, 2017. Therefore, 1st August was also chosen as the annual anniversary of the company’s establishment and to remember the first Cruise to sail in 2017. 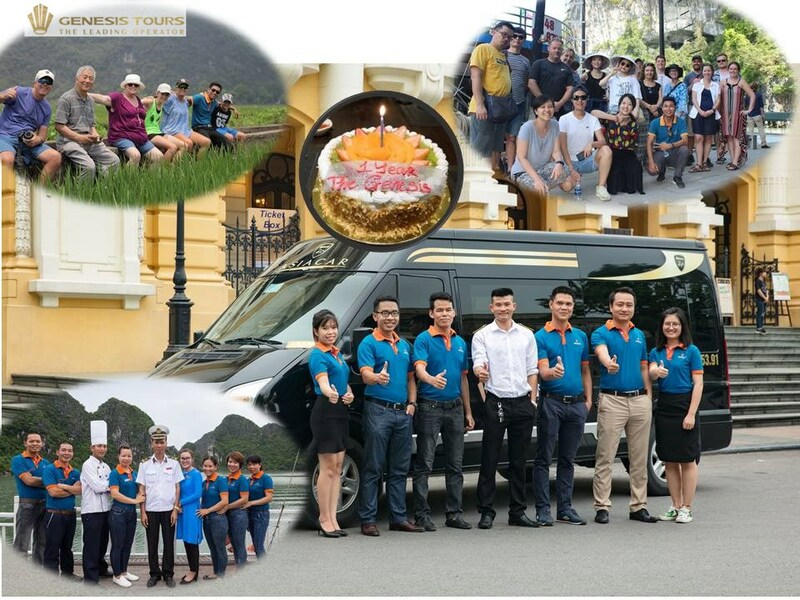 Along with the efforts of the staff in listening to customer care every day and the improvement of product quality day by day, Halong Bay Luxury Day Tour by Genesis has been more appreciate from visitor, introduced on the prestigious international tourism forum. And it is the good base for next big step is Halong bay luxury cruise – Genesis Regal 5 star. 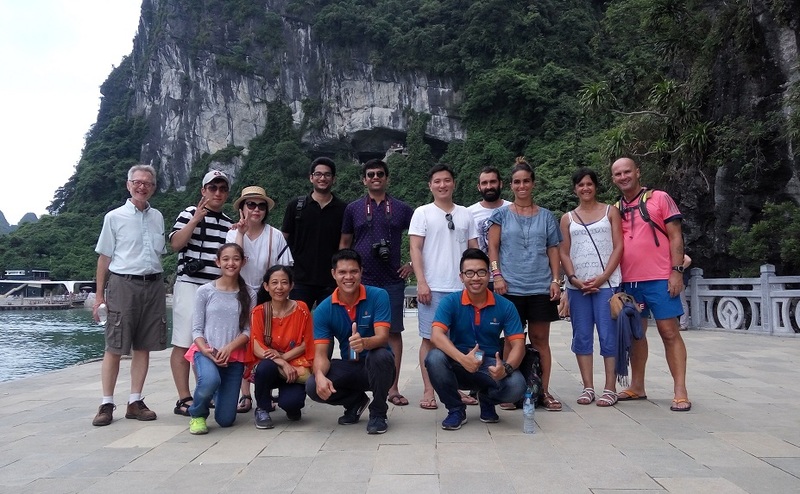 In April 2018, with the support of customers and partners, Genesis has launched the second day tour, which is Ninh Binh Prime Day Tour (Hoa lu – Tam Coc Tour). It is considered as Halong Bay on land with many beautiful natural landscapes along with the cultural and historical relics since the establishment of the country over 1000 years ago. Ninh Binh is becoming an attractive destination only after Halong in the North and Genesis’s goal is to bring a most balanced day tour between nature – culture as well as activity – relax to offer the most complete experience for visitors to Ninh Binh. Together with the high quality day tour, another project of the company had been developing in early 2018, which is the luxurious Regal Cruise, serving tourists in the Halong Bay – Lan Ha. – Cat Ba Island by on board overnight trip for Halong bay luxury cruise. The Total projects have 6 Cruises, which will be implemented from 2018 to 2023. Genesis is gradually going up to the trust and love of customers as well as the growth of the corporate staff in the company. Genesis Cruises Vietnam is a new brand on field of Halong bay luxury cruise. Genesis is combined between the rich experience of the leader and the enthusiastic, new ideas of the young members. Cause of the love to Halong Bay that help the team create new brand, products that focus on offering a complete experience for each journeys of tourist. This start-up project works with the motto “Think Big – Do Small”. ‘Think Big’ means carrying the macro plan along with the specific development strategy in each stage of the company. In addition, the “Think Big” will always help the leader of the company with their team to build the best quality products, grab the new trend and demands of customers. As well as bring the most experience to customers for their trip to Vietnam, especially the beautiful wonder – Halong Bay, with almost are Halong bay luxury cruise. Meanwhile ” Do Small ” means to implement the ideas and big plans, it is necessary to start from small things. Instead of chasing large investment in overnight cruises, the project began to complete product of Halong one day tour from Hanoi, to bring a full experience of Halong Bay for guests who have little time to travel or do not want to sleep overnight on the cruise. Doing small also means bringing the most enjoyable experience for customers to set up products in which the interior decoration, meal dishes, tour schedule…in very detail to ensure guests will have a full experience. For a trip to Halong is not only beautiful nature but also experience of the local culture. “Do Small” also means that things from the smallest things such as sales, operations or customer care … to ensure the professionalism of the staff, the quality of the product that the company offers to the customer. Genesis always focus customer to provide the perfect experience that customers want. For other members of the Genesis team, Geners’ working motto is “Passion –Method- Creativity.” Firstly, you need passion to love for your career and customers … to be able to do the job in the best and most comfortable way. The next is the Method; Genesis always aims to professional in any department, to maintain the quality of products as orientation. Finally, Creativity is an infinite resource in every human being which helps each member of the team breaks the limits, rules of existence … to bring better services. New ideas contribute to the development of products, services of the whole company. One year of Genesis, 1st August 2017 – 2018. We have been serving thousands of tourist every month. By September 1, 2018, the Hanoi – Halong highway was inaugurated and put into use, helping to reduce time between the two cities to 2 hours instead of 4 hours before. This helps Genesis’s Orientation in providing a high-quality one-day tour with the comfort of traveling and the fullest experience of Halong Bay. Together with the high quality day tour, another project of the company is developed in early 2018, which is the luxury Regal Cruise, serving tourists in the Halong Bay – Lan Ha. – Cat Ba Island. The Total projects have 6 Cruises, which will be implemented from May 2018. In the period 2018-2019, there will be the first two cruises in the project, expected to be completed and put into operation. The first cruise was Genesis Regal No.1 with 20 cabins. The three main room types are: Senior Suite, Family Suites and VIP Regal Terrace Suites. Along with functional rooms like massage, restaurant, bar, reception … promises to bring tourist market to Halong Bay – Lan Ha in a high quality products with luxurious service and perfect experiences. Regal No.1 is scheduled to be put into service in January 2019. Product’s orientation of the company from now on will be “Tradition combined with luxury”. Why is The Name Genesis? For any start up, naming your project is also an interesting and also much enthusiasm. The first name chosen for the company was not Genesis. It is another English name, Odyssey, comes from Greek mythology, following to the trend of ships naming in Halong Bay such as Aphrodite, Hera, Athena, Calypso … However, after careful study of the orientation product, enterprise’s culture, chose the last name is Genesis, full name is Halong Genesis Cruise, Halong bay luxury cruise. Genesis is a Greek original word, today widely used in many languages ​​of different countries. Its meaning is “originality”, “origin to be something”, ‘’traditional”, ‘’creation’’ … that is also true of the company’s orientation is the desire to bring the traditional features of the country into the Its products, cultural characteristics of East Asia. Genesis is also the name of the first book in the Bible, explaining the origin of life on our planet, which is also familiar to many nations around the world. The last action to confirm that name choosing, we have tried a foreign tourist consultation at Hoan Kiem Lake. We listed three final names and conducted surveys with 500 guests. And finally, Genesis has the highest rating. About the icon in Genesis’s logo, with many foreign customers will find it strange; however with the Vietnamese it is very familiar. That is the image of the ancient crown of King Hung Vuong, the first king to found Vietnam more than 4000 thousand years ago, the King of Kings. That is also the start of Viet country, the origin of Vietnam today. The crown represents the national origin, traditional culture, and also the elegance, luxurious of the imperial palace. 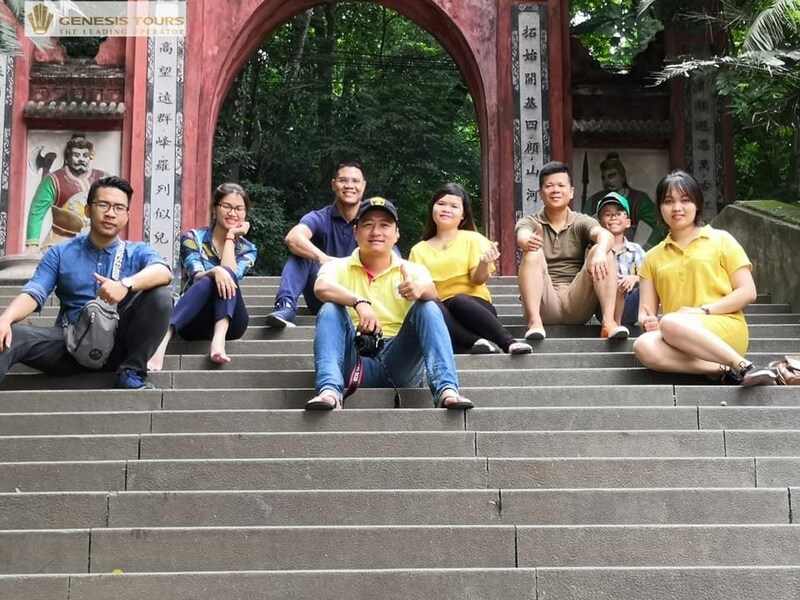 Genesis team had an family trip to visit Hung King (father King of Viet country) temple in August 2018, Hung King is a inspiration of Gen team. We have just introduced you to some information about Genesis Cruises Vietnam. With our passion, enthusiasm and method, we will bring the best products to customers. We also hope to receive much love from you for our all tour product. In the 15th April, 2019, the big next project of Gen team is 5 star Genesis Regal Cruise. It is a milestone for the development of this company as the important result for team’s effort.